To view a map of the Tramway - click this link. A view of the tramway looking towards Blaenau Ffestiniog as it curves past Llyn Bowydd. The mountain in the centre background is Allt Ddu. 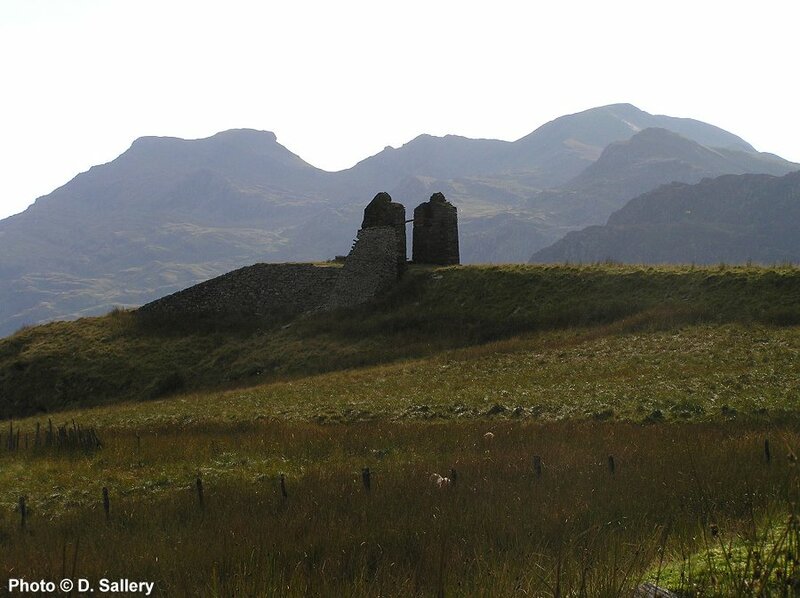 To its left can be seen the summit of Cnicht while to the right Snowdon dominates the view. 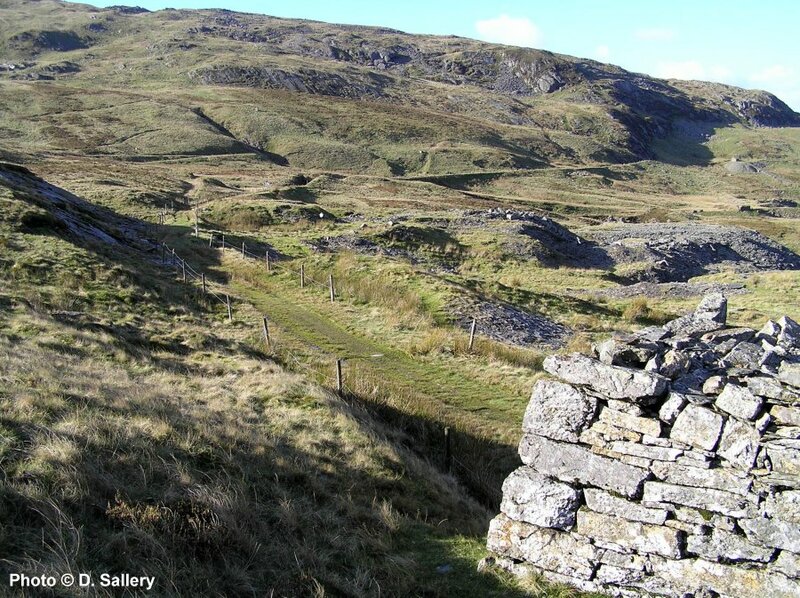 The route of the Rhiwbach Tramway starts from what was once the Ffestiniog Railway's Diffwys station in Blaenau Ffestiniog. This area is now the town's main car park and the FR station building sees a new use as a public convenience! It may be recognised by the two "Fleur de Lys" crests adorning the respective entrances. There is a small industrial loco preserved on a plinth and the incline directly behind it led to Fotty & Bowydd Quarry, this has no connection with this account. The first incline (Rhiwbach No.1) of the route, which leads ultimately to Rhiwbach Quarry, goes steeply up on the left hand side, of the square and is quite difficult to spot at first. After a further two inclines, known as Rhiwbach No. 2 and No. 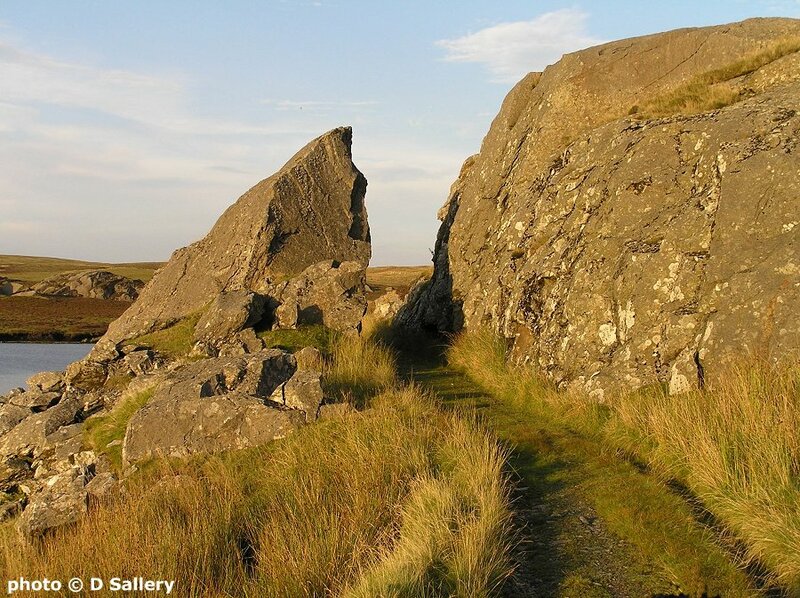 3, the tramway emerges onto open moorland at nearly 1600 feet above sea level. As previously mentioned, this account is in reverse order and describes the route from Manod quarry to the head of the Rhiwbach No. 3 incline. The tramway was built by Owen Gethin Jones, a local contractor from Penmachno. He is perhaps best remembered for the construction of Gethin's Viaduct, the major engineering work on the Conwy Valley line between Betws y Coed and Pont y Pant. He was also the builder of the Rhiwbach quarry engine house. The Tramway is constructed to a high standard throughout with rock cuttings and impressive embankments. Construction commenced in 1861 and the tramway opened throughout by 1863. First quarry to abandon use of the tramway was Manod, probably in the 1930's. Rhiwbach quarry itself closed in 1953 and the track was lifted between there and Cwt y Bugail in 1956. The last use of the tramway, by Cwt y Bugail, was in 1961 and all the remaining track was lifted by June 1964. However sleepers remain in many places together with the odd length of rail. The tramway was designed for gravity working from the Rhiwbach end with horses returning the wagons to the quarries. There is some doubt as to how successful gravity working was, however, as some of the gradients appear very slight. There is no record of any steam locomotives being operated on the top section of the tramway, due to the very light rail it was laid in, but several small petrol driven vehicles were used. Records exist of Rhiwbach Quarry having three locos at various dates while Cwt y Bugail also utilised such machines. There was never a passenger service over the line but a workmans train ran for some years as far as Cwt y Bugail and possibly beyond at times. 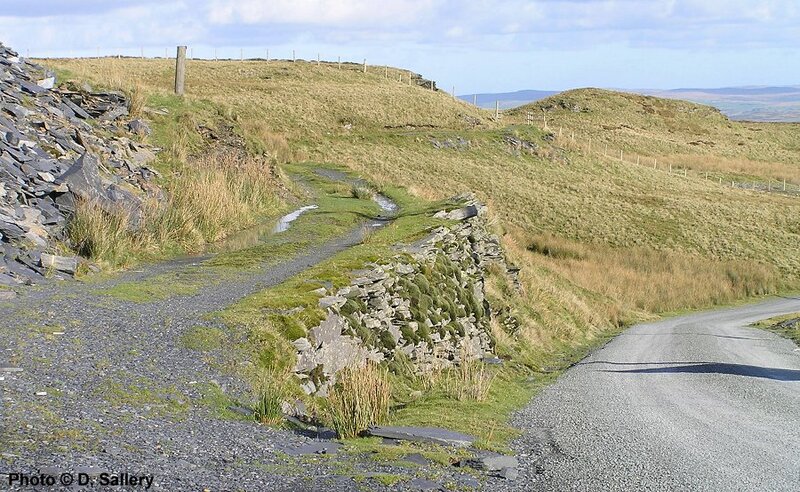 Access to the start of the route is via a very steep unclassified road from Llan Ffestiniog which leads up through Cwm Teigl and ends at the Manod Quarry of Welsh Slate - now renamed Cwt y Bugail. There is a small parking area just before the quarry entrance. The start of the route is the trackbed of the rail connection from Manod quarry to the Rhiwbach Tramway. Looking towards Blaenau Ffestiniog. On the right of the photo is the head of the incline from Rhiwbach Quarry. The well graded route of the tramway is very noticeable. Now heading back from Rhiwbach Quarry, the route is retraced past the junction for Manod Quarry and along the shoulder of Manod Mawr on a well engineered, gently falling, stretch of the old tramway. Looking back towards Rhiwbach incline head, visible in the top left. 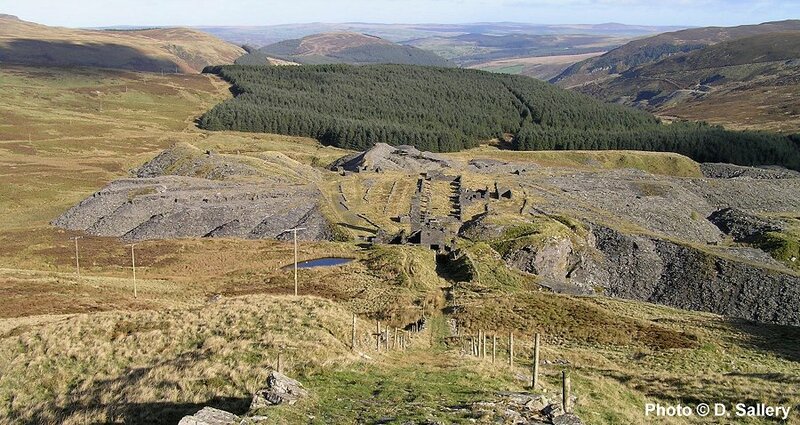 After about a mile the ruins of Blaen y Cwm Quarry are seen down to the right. 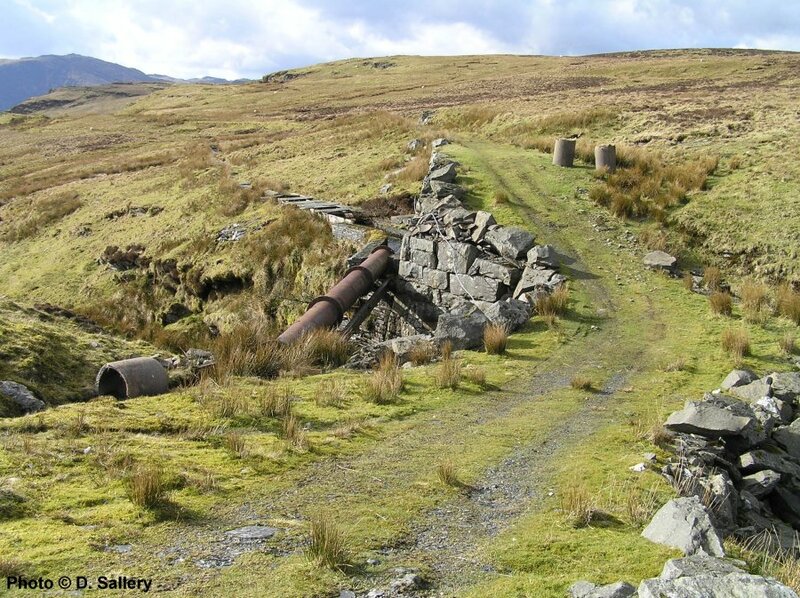 On the left near the head of the Blaen y Cwm incline can be seen a water filled adit. The large ruined drumhead is on the right and a short incline leads down to the former dressing shed. To read more about Blaen y Cwm, click this link. Looking back towards Rhiwbach and Blaen y Cwm from near Cwt y Bugail (old) quarry. Leaving Blaen y Cwm quarry the route carries on for about half a mile on a shelf along the mountainside and then through a rock cutting with the ruined barracks block of Cwt y Bugail (old) quarry on the right. A modern gate on the right mark the junction of the trailing connection into Cwt y Bugail (old) quarry. The tramway siding serving Cwt y Bugail (old) quarry diverged to the right just in front of the tips. The steep gradient up from the quarry meant that wagons had to be hauled to the tramway interchange using a wire rope powered by the quarry steam engine. Leaving Cwt y Bugail, a stile is crossed, this marks the boundary of the Snowdonia National Park and was the old Caernarfonshire/Meirionydd border. 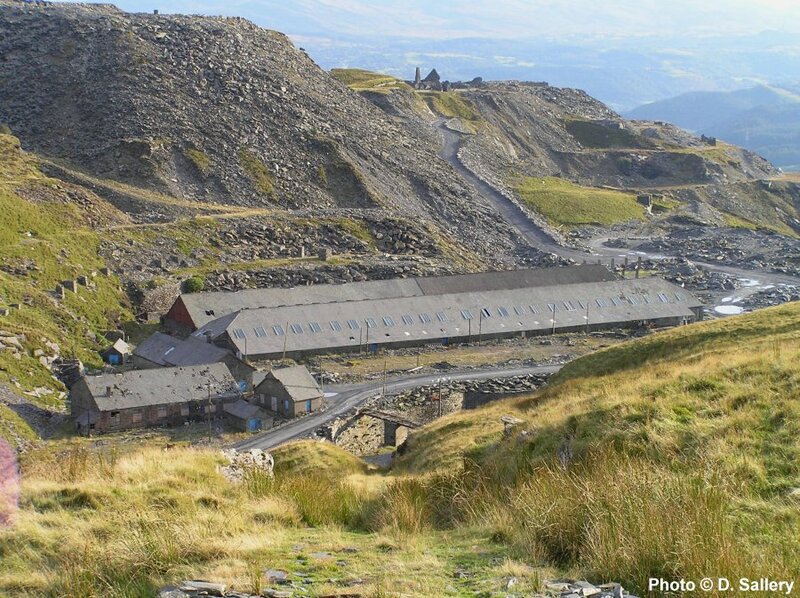 The area around Blaenau Ffestiniog has always been excluded from the National Park because of its industrial development. An impressive vista now opens up of the Moelwyn Mountains, Cnicht, the Glyders and Snowdon. The next few hundred yards can sometimes be very wet and it is best to follow the faint path on the right bank of the formation. 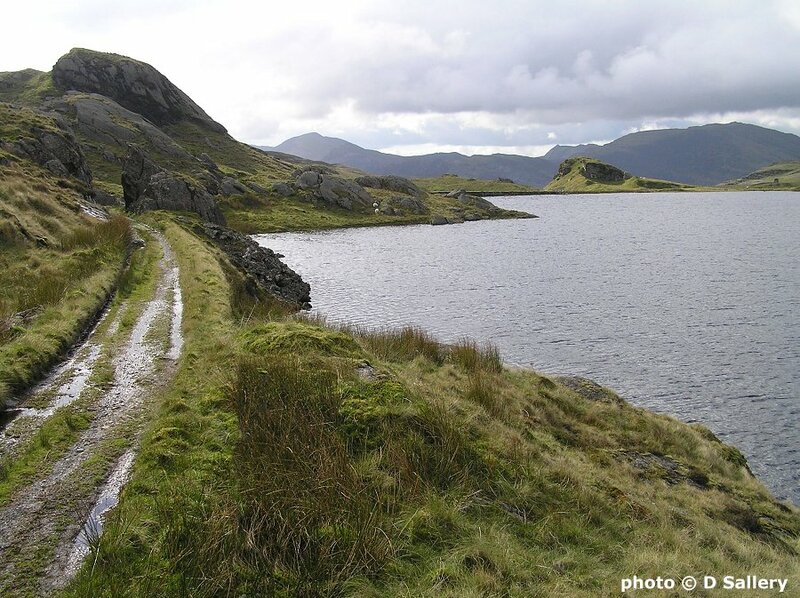 Further on the trackbed dries out as Llyn Bowydd is reached and the line maintains its gentle downward gradient through a succession of impressive cuttings and embankments above the edge of the lake. edge of Llyn Bowydd. The high quality of the construction can be clearly seen. Leaving the mountainside behind, the trackbed passes along the dam for Llyn Bowydd. A slate lined leat, which is still in use, leaves the lake on the left. A little further on the head of Llyn Newydd is reached, there was originally a wooden bridge at this point which carried the line above the outlet stream. This was washed away some years ago and only the bridge abutments remain. 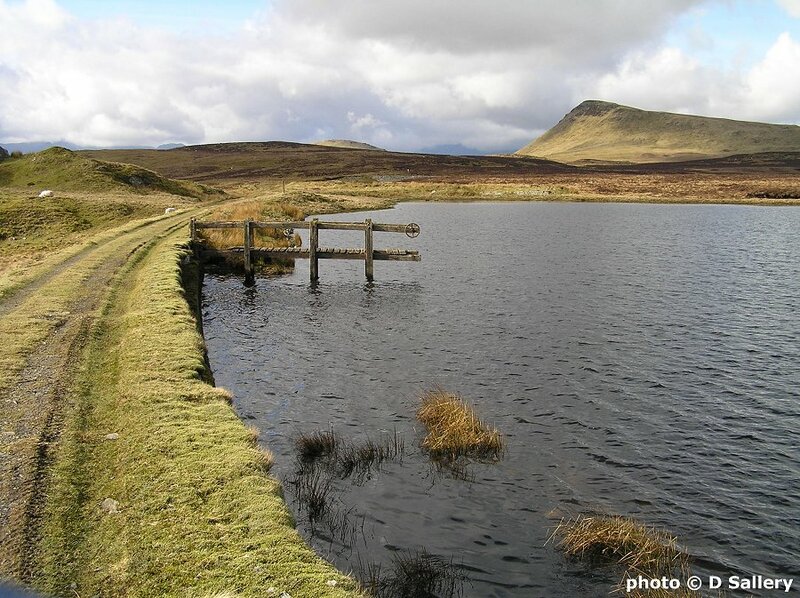 The leats from Llyn Bowydd and Llyn Newydd join here and parallel the tramway towards Rhiwbach No. 3 incline head. 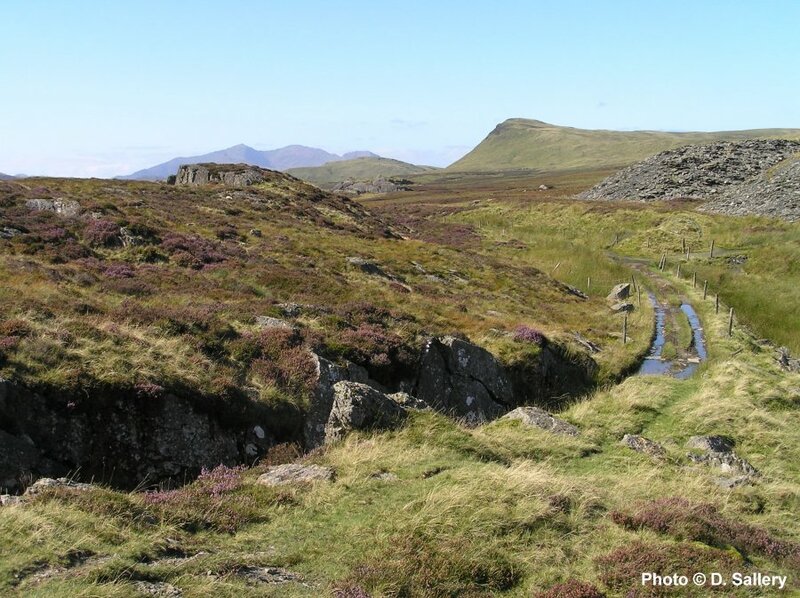 The leats from the two lakes join and the combined stream is carried in a slate lined trough which parallels the tramway for the final half mile to the head of Rhiwbach No.3 incline. 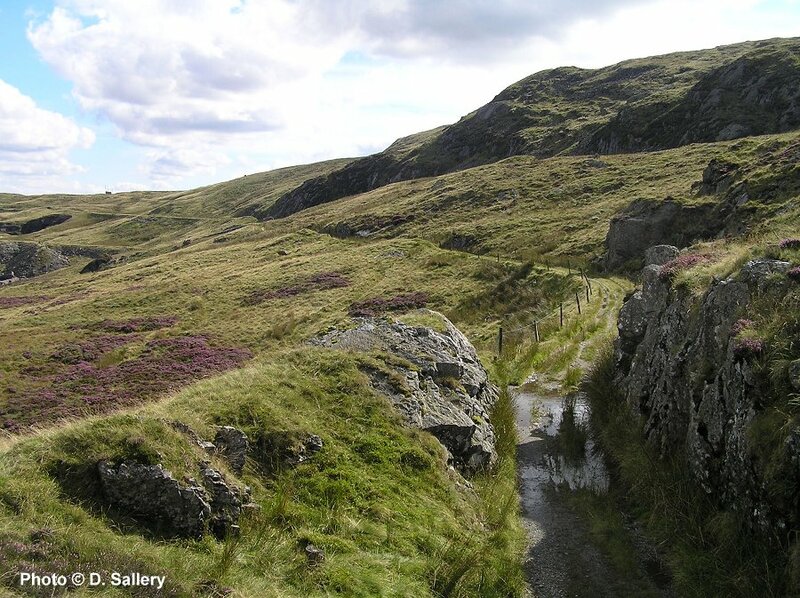 This leat continues down to Llechwedd Quarry where the water is used to generate hydro electricity. The head of No.3 incline gives a panoramic view over several of the Blaenau Ffestiniog quarries, with most of the town itself hidden from view below. At the bottom of the incline can be seen Maenofferen Quarry. 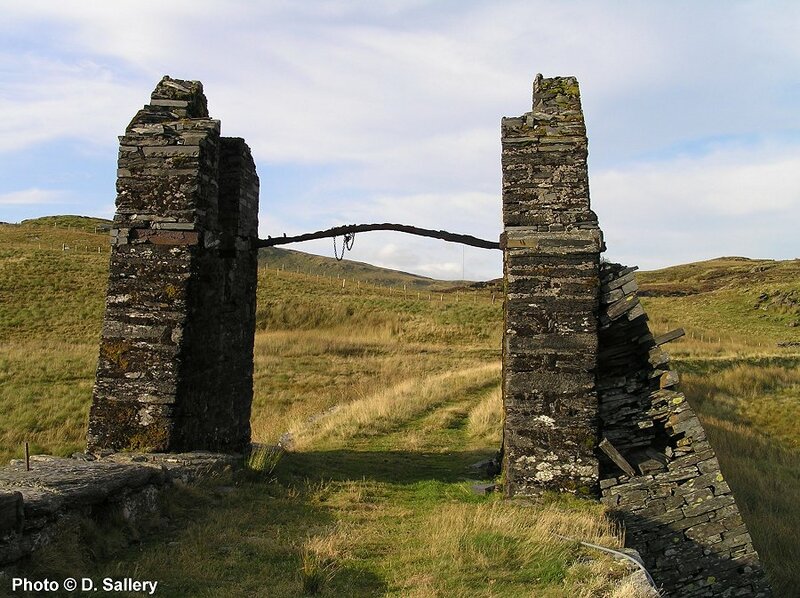 Until it closed in November 1998 it was the last underground slate mine in the district. 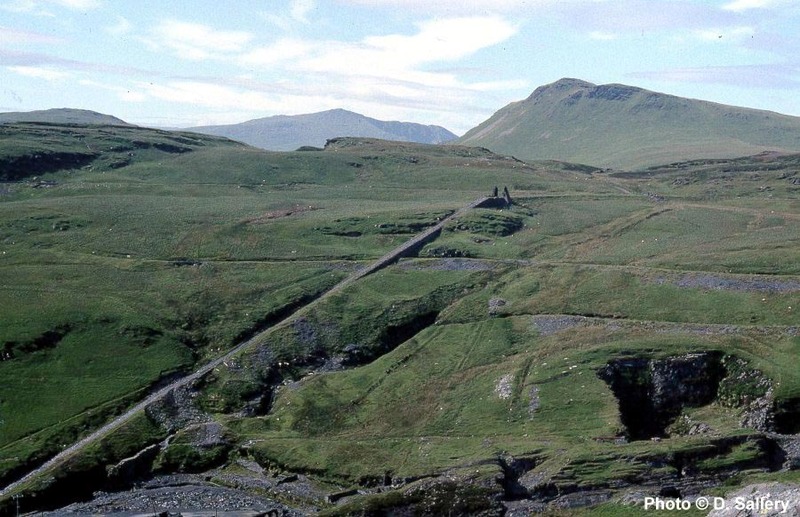 As the route of the tramway from here down to Blaenau Ffestiniog passes through a working quarry area it is recommended that the route back to Manod is retraced. This is the derelict drumhead of Rhiwbach No. 3 incline. So named because it is the third and last on the ascent from Blaenau Ffestiniog. In the background are Moelwyn Mawr and Moelwyn Bach. No trace of the drum or roof remains but the structure still stands proudly. Looking down the incline at Maenofferen quarry dressing sheds. Since this photo was taken the buildings have suffered badly from vandals and the weather. In the view above, from the other side of the valley, the tramway can be seen leading off to the right. At the bottom of the photo are some of the workings of Maenofferen Quarry. 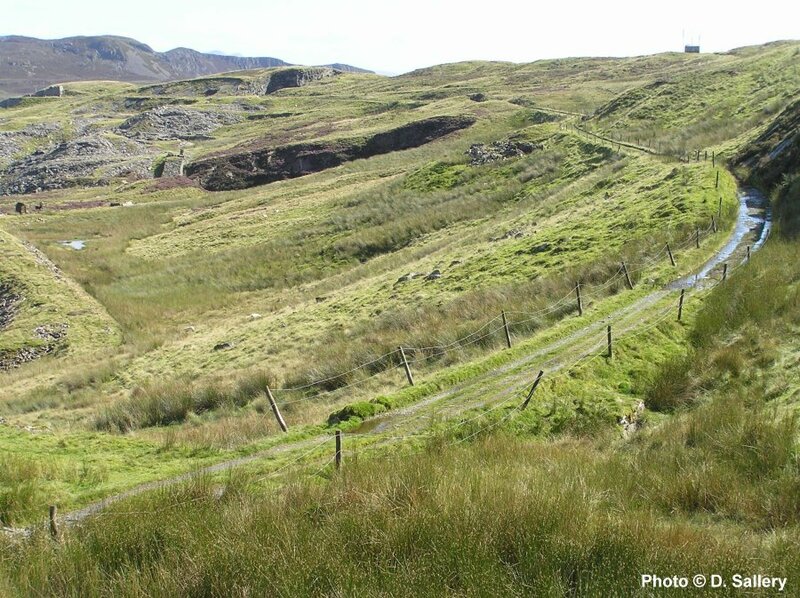 The horizontal lines on the mountainside mark the course of leats carrying water from Llyn Newydd and Llyn Bowydd. Moel Penamnen is the peak to the right with Moel Siabod in the centre background.